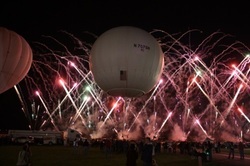 The 56th Gordon Bennett Gas Balloon Race is set to launch this weekend from Toggenburg, Switzerland. Seventeen balloons representing 8 countries will launch into the night sky Saturday evening with one objective, fly farther than anyone else. This adventure race is never without drama and early trajectories show balloons flying south from Switzerland before eventually turning west to Spain. A similar path to a race a few years ago that also launched from Switzerland. In that edition of the Gordon Bennett, the winners landed near the Southwest coast of Portugal after spending almost a day and a half over the Mediterranean Sea. Several balloons that missed the western wind flow landed on islands in the sea, and three balloons slowly crept south eventually landing in Africa. We'll update here as the race progresses, but also check out the event links on the right of the page.